Here at Miracle Method, we’ve seen a lot of homeowners attempting to paint their countertops only to be extremely disappointed. The sad truth is that Do-It-Yourself (DIY) projects for painting countertops rarely get results that stay bright and add years to your countertop. Many of the DIY kits require ineffective surface sanding, and utilize cheap epoxy topcoats that yellow over time. Countertop surfaces presents different challenges to get new finishes to adhere, look good, and provide many long years of service. The key to any good refinishing job lays in the use of hi-tech primers, acrylics and clear coats, and getting them to fuse together into a new surface. 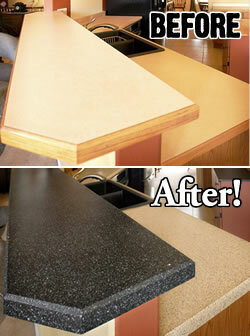 For professionally refinished countertops, there are no shortcuts. 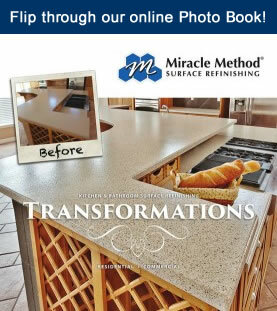 At Miracle Method, we use a proprietary seven-step process to repair and restore a countertop. Our Natural Accents Stone Finish is a great example of an inexpensive, professionally-applied countertop solution. Not only does the Natural Accents Stone Finish look like a granite countertop, but creates a surface that is seamless, non-porous, heat and scratch resistant and repairable if damaged. Natural Accents Stone Finish is also FAST! The entire process only takes 48 to 72 hours, not weeks. If you are considering painting your countertop, don’t do it yourself! Check for a Miracle Method location in your area, or call our toll free locator number 855-212-7337 to find the Miracle Method office closest to you and request a free estimate. We feel that once you have all the facts, you’ll understand why painting a countertop is not a Do-It-Yourself project, and why Miracle Method is the best choice for refinishing your countertops.